Alpinequest is superb. It was my first choice after evaluating 6 navigation apps. It's fast, elegant, offers numerous maps, allows you to easily combine maps into a custom map, its developer is responsive to user's requests, and much more. It can calculate a trip's elevation gain using a Digital Elevation Model (DEM) instead of the built-in GPS. In practice, GPS altitude isn't very accurate and the total ascent for a hike is typically a wildly inflated value. By using a DEM, Locus Map reports far more conservative values that are consistent with what a barometric altimeter produces. Alpinequest can do auto-routing but only for roads and only when connected to the Internet. With Locus Map I can plan a hiking route and determine its length and total ascent all while offline (for both roads and trails). It can be configured to periodically report (verbally) the distance travelled, elapsed time, average speed, etc. I find this handy to keep track of my progress throughout a hike. This is useful if you switch between activities like Hiking, Running, Walking, Cycling, Driving, etc. The settings for one activity may not be best for another. For example, the track-recording rate for walking need not be as fast as for driving. Perhaps you want the onscreen menus to be different for cycling compared to running. When you record a track you may want your hikes to be saved in the Hiking folder and runs in the Running folder. What Audio Coach reports for running may be different from Hiking. Changing all these settings before each activity is a tedious proposition. A "preset" lets you define the settings for each activity. When you go running, you pick the "Running" preset and all settings are automatically changed to suit the activity. Easy-peasy. A vector map is more space-efficient than a raster map (i.e. the typical online map). All of New York state fits into ~275 Mb and includes Points of Interest (POI) like amenities, historical sites, etc. It's more than just a map; it's a searchable database of geographic data. For hiking purposes, it contains the location of campsites, lean-tos, viewpoints, etc. Using a vector map, Locus Map can list all POIs close to your current position ("Nearest points" function). It has a large and active user community , and a very responsive developer who puts out several significant releases annually. Bugs are fixed very promptly. Check out Locus Map Free. It displays some advertising but has no expiry date. Some of the more advanced features are disabled (or limited) but there's sufficient functionality to give you a good idea of its power. You can download three vector maps ("LoMaps") for free. It also provides an extensive list of free raster maps. The full version (Locus Map Pro) is CDN$8.49 so I imagine it's under US$7. It's less expensive than competing products yet offers so much more functionality. Last edited by Trail Boss; 10-20-2017 at 11:12 AM..
Johnny Virgil, you sure the area that you saved is only of the Adirondack Park pretty much?...because I feel like I downloaded correctly and mine was only 154MB. It was SPOT ON at the Carry Leanto and the Cedar Lake Dam, and the bridge at Cedar Lake that separates Cedar Lake and Beaver Pond, so I felt confident that it was very accurate and reliable. Just a few disappointments; when doing the tiny portage around the beaver dam at the entrance to the Cedar River on the south side of Cedar River Flow, the app / map showed us still out in the middle of the lake...and that might be because it has a hard time figuring out what is shoreline and what is marsh? It also did not show the spur trail into Lost Pond near Cedar Lake. Also, when looking over the map into the Five Ponds, it showed the trail along the Oswegatchie but it did not show the trails into the Five Ponds or Wolf Pond or Sand Lake or Cage Lake. The map's contents. The more detail, the more space it'll need. For example, satellite imagery is very detailed. The size of the area you wish to download. The number of magnification/zoom levels. The size increases rapidly when you request the most magnified levels (typically higher than level 15). 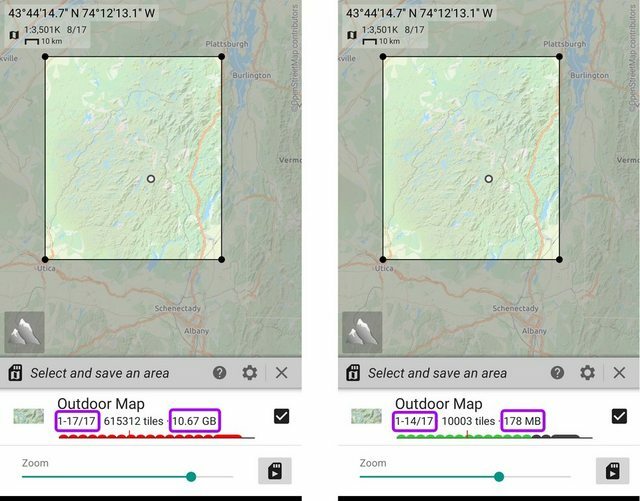 Here's are two examples of downloading about 90% of the Adirondack Park using the same map (TF Outdoors, a derivative of OpenStreetMap). First one requests all 17 zoom levels and the resulting file size will be 10.67 Gb. Second one requests 14 zoom levels and the size will be 178 Mb. It's difficult to comment because you did not specify which map you downloaded. However, I'll take a guess it was Gaia Topo which is derived from OpenStreetMap. How this information is described on a map depends on who draws the map. USGS 7.5' Topo provides a detailed representation of the marsh/lake border. TF Outdoor (derived from OpenStreetMap) simplifies it. Caltopo's Mapbuilder Topo simplifies it even more. ...it did not show the trails into the Five Ponds or Wolf Pond or Sand Lake or Cage Lake. The trails in Gaia Topo come from OpenStreetMap (OSM). OSM is created by volunteer map-editors (like me) who collect information and add it to OSM. The quality and comprehensiveness of the information depends on the region and the availability of interested map-editors. The missing trails you mentioned have simply not been added by anyone (yet). It will take someone with an interest in the area to record, or collect, GPS tracks of the missing trails and draw them in OSM. Similarly, a willing map-editor can use a satellite image as a reference to add details to the marsh/lake shoreline. Last edited by Trail Boss; 10-23-2017 at 09:57 AM.. Thank you for going into such detail Trail Boss. Thing is, I am pretty sure I downloaded at highest quality / most detail offered. I slid the bar all the way over to the right and saw file size increase and map grid ratio decrease. I could see no other way of going bigger / more detail. Anyhow, trial time is almost expired, I will be paying or it and try to learn it more. And maybe I'll put it in record mode and head down into Sand Lake from Wanakena and come out at Star Lake sometime soon! Hey, you're welcome! The more one understands how the app works, the easier it becomes to use it. When you slid the bar all the way to the right, do you recall the number displayed under "Max Zoom"? The Adirondack Park is 6 million acres. All of that with 17 levels of magnification in just 155 MB is a neat trick. It implies the use of a vector map (as opposed to a raster map). However, if the max zoom was 14 or less then 155 Mb is feasible with a garden-variety raster map. BTW, if you want to use a free iPhone backcountry navigation app (not just for 7 days) consider trying ViewRanger. The app is free and they make their money by charging for "premium maps". Their free maps are from OpenStreetMap (which is what Gaia Topo is derived from). For basic map viewing, map downloading, track recording, waypoint creation, navigation, etc it's on par with GaiaGPS. You can also (optionally) create an account with them to share GPS tracks with other ViewRanger users. Viewranger's "Getting started guide" for iOS. Last edited by Trail Boss; 10-23-2017 at 12:01 PM.. Trail Boss you seem like a bit of an expert on the subject, so which app for iPhone do you recommend I stick with? My primary uses for the app is to (obviously) see where I am at at any given time, check progress of hike and how much further to destination...but I'd also like to do stress free peace of mind off trail exploration and camping...it's one thing to explore and camp at places along trail that hundreds or thousands of people have experienced...it's kind of "next level" type stuff to follow off trail pond or lake drainages back into the pond or lake and camp. And 2 people with 2 separate devices with the same app is probably redundant enough for safety and finding your way out. Last time it said all of that (including an expected 758 MB file) but after selecting that and downloading it only ended up being 154 MB, so, I don't know! But there is still no iPhone version, correct? I did the entire park, edge to edge. I do recall the download stalling sometimes , and I needed to give it a boot. It can tell you it's "done" when it's not, especially if you are not on wifi. ... which app for iPhone do you recommend I stick with? I can't answer that question because I don't own an iPhone and have never compared its available navigation apps. However, I do recommend you try more than one app and discover which one you prefer. I had compared six apps (on Android) before choosing the one I thought suited me best. Ultimately, I switched to another app several months later (after becoming more familiar and desiring more features). By trying at least one or two other apps, you get a better idea of what is available and what is most important to you. Ultimately, it may very well be Gaia GPS but by comparing it to others you'll know its strengths and weaknesses and how well it fits your needs. BTW, if an app offers no trial version, contact the developer and ask if you can get one so you can evaluate the product. I did this for Alpinequest and the developer graciously offered me a free license (I paid for it afterwards). FWIW, I tried the Android version of ViewRanger (free) and it's easy to use but they continuously try to sell you the "premium" NeoTreks maps. The default, free, Outdoor map is usable but I found downloading it for offline use to be very slow (and it was via Wi-Fi). I think they purposely throttle the download speed to be uncomfortably slow (so you consider buying the NeoTreks maps). You may find this to be a deal-breaker. ... and a map and compass and the skill to use them. No batteries required! Correct and (unfortunately for iPhone users) unlikely there will ever be one. An iOS-compatible version has been requested for years but the developer has declined. It's a small development team based in the Czech Republic. They have a European customer-base where iPhones aren't as prevalent as in North America. They've been running the business for at least 5 years and I guess its been sufficiently profitable to ignore requests to expand to iOS. 758 Mb, for 14 levels of magnification, sounds a lot more realistic than 154 Mb. ... I do recall the download stalling sometimes ... It can tell you it's "done" when it's not, especially if you are not on wifi. For my own education, can it download maps in the background? For example, while it's downloading a map, can you switch to and use another app? Downloaded again, file came out even smaller this time. I'm confused by your statement that it says "758.3 MB" before downloading begins but then ends up being only 154 MB after downloading ends (or "even smaller this time"). So Gaia reports only 154 MB was downloaded after the process completed? When you repeat the process it's even less? When you browse an online map, Gaia automatically stores the displayed map locally (it "caches" the map) for future use. When you request to download an online map, Gaia stores it locally but only downloads the portions that aren't already in its cache. If you repeat the download process for the same or nearly the same area, it uses what it has on-hand and only downloads what is missing. Anyway, it's just a theory because it's terribly wrong to predict it'll be as big as an aircraft carrier and then only delivering a tugboat. Normally it creates a separate map for each download attempt, at least in my experience. Maybe try going into your maps page, click on each one (there will be multiple if it's behaving like I think it does) and delete it. Then when your map page is empty, try again with the full map download at desired zoom levels and see how it goes. Honestly, I don't believe my own theory but I'm grasping at straws to explain the bizarre discrepancy between the predicted size and the reported downloaded size. I definitely agree that each downloaded map is a completely separate entity and the app shouldn't be "borrowing" map tiles from existing maps or even its cache. FWIW, when I use Alpinequest to download most of the ADK Park (using Outdoor Map), with 14 zoom levels it predicts 196 MB. If I increase it to 15 zoom levels the predicted size inflates to 771 MB. Perhaps there's a bug in Gaia where it predicts one thing but delivers another? I found my older LG phone's GPS reception limited and it being extremely temperature sensitive. I'm continually loosing or very slow to find satellite lock in a heavy canopy and too hot or too cold it will just lock up. Too many times now when I check the phone has just shut off. I'm sure it has to do with the LG phone but for me totally unreliable. My paddling partner's GPS always runs and has satellite lock. Looking at this question from a different angle. Most All of us are in the woods on or off trail because we like to hike and see the view of near and far. Every moment we are looking down at an Nav device weather electronic or "old style" map and compass we are not enjoying the view. So the question is for me what is quicker with the required accuracy? Map wins every time when on a trail and wins almost every time when off trail. I can not remember the last time I used my compass when on trail. When I’m off trail it is usually just a quick glance at my compass to stay on course coupled with a min or 2 to orient my map to compass when planning my next bearing to proceed on. — quicker than using any stand alone GPS or phone based app. Plus in my endeavor to see more near and far my map is so much lighter in weight, every oz counts. As I opened my post with, "most of us," there are certainly others that I am definitely not addressing. Those are the individuals who are, what I call, interested in "bragging rights". Not bad. This thread managed to stay on topic for umpteen posts before it pivoted to the recurring holy war of "GPS vs map & compass". ... then they simply haven't mastered it yet. Either way, for whatever navigation method you use, proper pre-trip planning and intimate knowledge of equipment and how to use it along with landform expectations and visual association with sourroundings makes navigation life magnitudes easier and faster than by blindly guessing with the confusion of what you are doing. Last edited by Wldrns; 11-01-2017 at 04:21 PM..
2nd the Android recommendation for LocusMap. I've used it in my lake mapping applications, and it is far and away the best app. OruxMaps is also good. For Apple devices, try out Map Plus by MioCool. Not to be confused with Maps+. Trail Boss, glad to see you're a LocusMaps fan! I still haven't gotten a chance to try AlpineQuest, but maybe now I won't bother since you've converted. I have both. It's still hard to beat AlpineQuest for sheer speed and the ability to quickly layer multiple maps. Locus Map only allows for one overlay layer whereas Alpinequest lets you stack many layers. To be fair, in practice I've not found the need to use more than one layer but others may have different needs. Locus Map has a boatload of additional features that are useful to me. The developer recently revised the Route Planner. It works completely offline and offers full auto-routing (with shaping, via, and nogo points). Anyway, it's good to have choices; either of these two apps is likely to meet the needs of most hikers. Thanks for the tip about Maps Plus. I'll check it out.